I just love puddle jumping photos, and I’ve been really looking forward to trying them for quite some time. 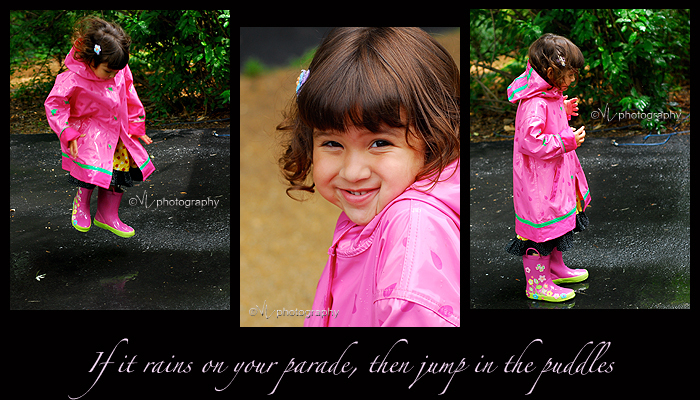 So yesterday when it rained, we got A. all decked out in her raingear and ready to play in the rain. Unfortunately, as is often the case with tempermental summer storms, the rain stopped before she even got outside. So we tried to make some fun with the tiny puddles we found. It didn’t seem to bother her too much that there wasn’t much splash. I love making storyboards, and hope to add this as a service for my clients. I think this would make a great inspirational poster, hehe 🙂 If you click on the photo you’ll see the full-sized version. Posted 11 years, 10 months ago at 8:50 am.